It seems there is a little bit of confusion surrounding callsigns not being displayed in the radio’s screen.. here’s a quick ‘how to’ that may help. As for callsigns on the various monitoring websites, don’t worry too much about that for now, because DMR-MARC is doing some big changes to the network, so please be patient. First thing you should know is that your rig is doing the job of translating the DMR-ID of the person currently transmitting to you, into a callsign and name for your rig’s display. The information to do this is completely held in a database in the radio, and it’s a very simple job to update it. 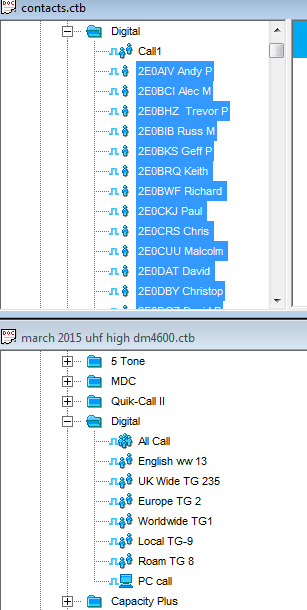 As more users are coming onto DMR-MARC you may want to update the contact list regularly. The radio can store a maximum of 1000 contacts, so when there are more than 1000 DMR-MARC IDs in the UK – you will have to delete some, at the time of writing this article there are 968 in the contact list generator that we are going to use. 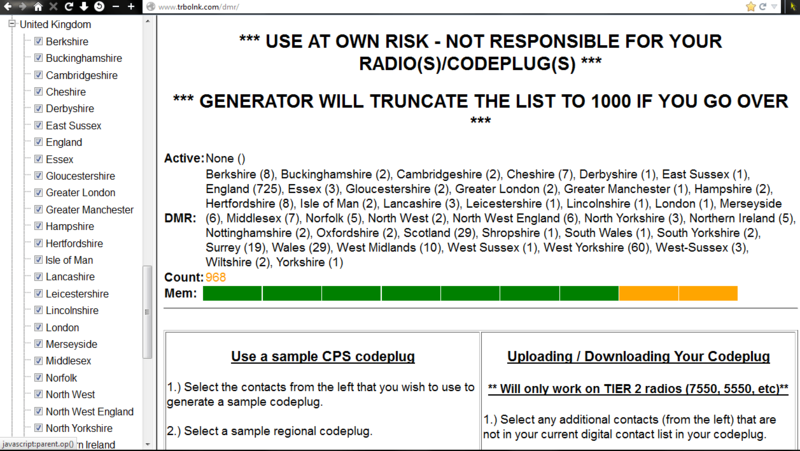 Some of your radio’s 1000 contact list capacity are taken up by Talkgroup configurations, but for most of us, that’s less than about 10, so at present we can fit all 968 contacts, and all needed Talkgroups into the radio ok.
A Website called TRBO LINK will automatically make you a codeplug (don’t write it into your radio, there are no frequencies in) You simply tick the regions of the world you want adding into your contact list. Here I’m assuming you are in the UK and wish to have all the present contacts displayed .. so here goes. Go to the Trbo Link contact list generator site here and select the contacts you are interested in, like i did below..
the coloured bar tells you how many contacts you have selected so far..
then when you have done that, check the number of contacts you have selected – if you do go over 1000 contacts, notice that it tells you it will truncate the list, also remember that you will still have to lose a few contacts if you get 1000 or more – because a few entries in your rigs database will be used for Talkgroup configuration. Next: Select the type of rig you have, or the nearest type, mine is the DM4600 – so i chose DM4601. and click the Generate button. save the file to your PC. Okay, so, the file it gave you is a codeplug, it will be named something random like 98649867509.ctb although for clarity you might want to rename it something more meaningful like “2015 March 6 contact list only.ctb” that i am using in this example. Next thing is to fire up the MotoTRBO CPS and read your radio – and save the codeplug you are using– name this something meaningful too, because if you run into difficulties doing this, you may just want to go back to what you are using now instead, but i doubt you will have any problems, as long as you know how to drag ‘n’ drop in Windows, and select multiple files. Now in your codeplug, navigate (in the left hand side Explorer type folder-view tree thingy) to the “Contacts” blue folder, then again into the ‘DIGITAL‘ in there.. That’s where your contacts are stored. You might want to have the CPS sort these by name or type, if you do, right-click and select Sort and choose which option. The secret here is to delete just the contact names and leave the Talkgroups, which sounds harder than it is, as the CPS already sorts the callsigns. Once you have selected the callsigns only, delete them. You saved the codeplug before you started right ?? Now as you see, i’m left with just Talkgroups in there. 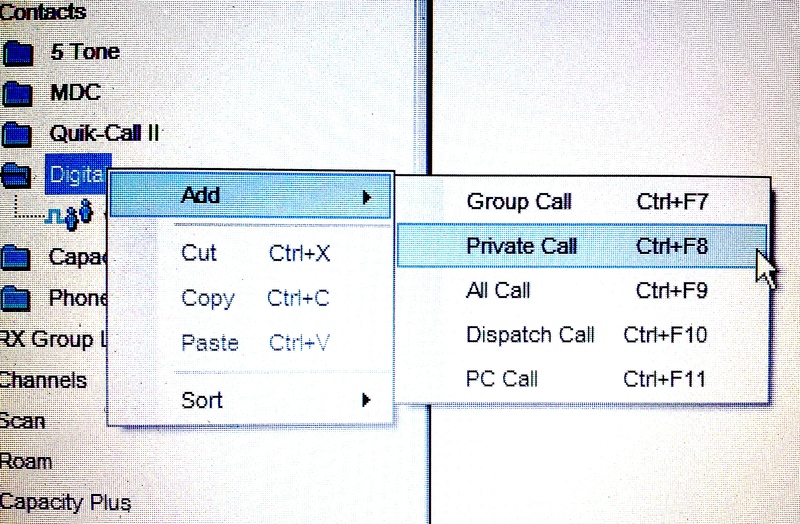 Yours should look something similar, Your Talkgroups are probably named something else. It doesn’t matter. 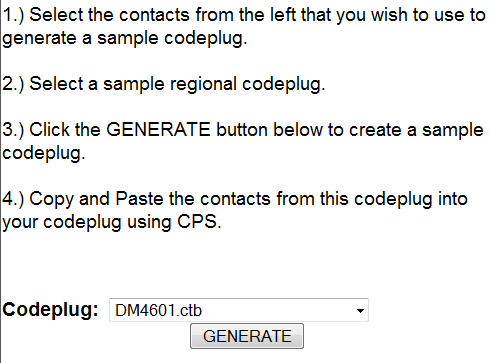 Now, In the CPS, keep your radio’s codeplug open and now click the ‘Open’ button and open the “2015 March 6 contact list only.ctb” (or whatever you named it when you downloaded it) – the codeplug that the Contact Generator Website just sent you earlier. Now you have your almost empty contact list in your radio’s CPS window, and the codeplug that the website sent you open in another window, both open at the ” Contacts / Digital ” folders. 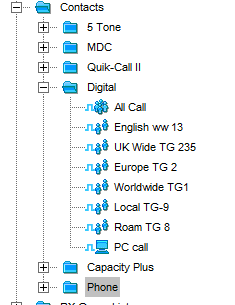 All you have to do now is select all the full callsign list out of the downloaded codeplug, and drag and drop them onto the blue “Digital” folder of your radio’s contact list. – it may take a few seconds to either move, drag or drop the new contacts into your rigs contact list. If you’ve been successful you can close the downloaded “2015 March 6 contact list only.ctb” codeplug and you dont have to save it if it asks. but you now only have your codeplug open and you can check it for typo’s and other errors before you write it if you want. Now add the DMAR-MARC ID of the callsign you just added above, this one here 12345678, is a silly example… dont use that, or don’t make one up, a proper UK one will start with 235**** 235 is the UK’s number. 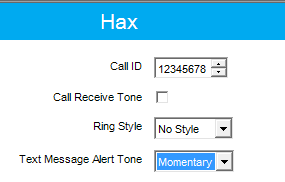 I untick the ‘ Call receive tone ‘ (the CPS automatically switches this on when you manually add a new digital contact) and set “Text Message Alert” to “Momentary” too. Now – once you have checked all this, and it seems ok, it’s time to write it back to your radio. You will want to SAVE this codeplug too, as usual, i strongly suggest naming and dating the codeplug’s filename accordingly. Looks like the link to the contacts manager is no longer hosted. Is there any chance of being able to get a copy of the Contacts manager software from you please, so I can edit my contacts in my DM6401 please? That should be Motorola DM4601, size 9 hands and small keyboards don’t help. Hopefully I’ll be able to edit the DM4601 so the contacts are in some kind of usable order instead of them being all over the place. Finding 4400 can take dozens of key presses! Sysop GB7XX – Tyneside’s first (and at this time only) DMR repeater. Great to hear Tyneside has joined the DMR experiment too ! I was over in Blaydon recently and forgot to take my DMR with me, i only took my P25 UHF ! I’m not sure if such a thing exists nowadays i’m afraid. The best thing is to perhaps look online for your local areas DMR groups on Google.com, Facebook or Twitter perhaps. Is the Trbo Link contact list generator discontinued?